Mon., June 4, 2018, 10:43 a.m.
Had things gone different, players like Mike Trout, Aaron Judge or Clayton Kershaw could be playing for Seattle. Imagine Giancarlo Stanton in left field and Aaron Judge in right. Only you’re not tuned to MSG and they aren’t wearing pinstripes. Instead, you’re watching Root Sports Northwest and they’ve got on the teal tops of the Mariners. Put Mike Trout in center field and you’ve got the American League All-Star team (or the New York Yankees, circa 2021). The Mariners could’ve had all three. Yet they bypassed them in Major League Baseball’s annual first-year player draft, instead taking D.J. Peterson, Dustin Ackley and Philippe Aumont. And you wonder why the M’s have the longest postseason drought in the four major professional sports? We’re reminded every year the draft is an inexact science. So why does it seem Bill Nye could’ve done a better job making selections for Seattle? The pick: 17. Evan White, 1B, Kentucky. A first baseman who is lacking in power. Is this Dustin Ackley, Part II? Should’ve taken/could’ve had: Too early to tell, but best they didn’t take Oregon State RHP Drew Rasmussen (Mt. Spokane HS), the 31st overall pick, who has undergone a second Tommy John surgery. The pick: 11. Kyle Lewis, OF, Mercer. Golden Spikes Award winner suffered a torn ACL in rookie season with Everett of the Northwest League and is finally back in form. Should’ve taken: 17. Forrest Whitley, RHP, Alamo Heights HS (Texas). Like the Houston Astros need another front-line starter. High school draftee reached Double-A in first pro season. Could’ve had: 66. Bo Bichette, SS, Lakewood HS (Fla.); 91. Austin Hays, OF, Jacksonville. The pick: None (lost No. 36 pick for signing free-agent OF Nelson Cruz from Baltimore). Could’ve had: 48. Scott Kingery, 2B, Arizona; 56. Brady Singer, RHP, Eustis HS (Fla.). The pick: 6. Alex Jackson, OF, Rancho Bernardo HS (Calif.). Already gone, dealt to Atlanta for RHPs Rob Whalen and Max Povse after 2016 season. Should’ve taken: 10. Michael Conforto, OF, Oregon State. Former Beavers star has already made an All-Star team. Could’ve had: 7. Aaron Nola, RHP, LSU; 13. Trea Turner, SS, N.C. State; 21. Bradley Zimmer, OF, U. of San Francisco. The pick: 12. D.J. Peterson, 3B, New Mexico. Has yet to play above Triple-A, currently with third organization of career. Should’ve taken: 32. Aaron Judge, OF, Fresno State. He would’ve hit one out of Safeco Field by now. Could’ve had: 39, Corey Knebel, RHP, Texas; 124, Cody Bellinger, 1B, Hamilton HS (Ariz.). The pick: 3. Mike Zunino, C, Florida. We’ve entered the month of Junino, but his career average (.209) is barely above the Mendoza Line. Should’ve taken: 18. Corey Seager, SS, Northwest Cabarrus HS (N.C.). Seager Bros. manning left side of infield at Safeco Field? Yes, please. Could’ve had: 11. Addison Russell, SS, Pace HS (Fla.); 19. Michael Wacha, RHP, Texas A&M; 41. Lance McCullers, RHP, Jesuit HS (Fla.). The pick: 2. Danny Hultzen, LHP, Virginia. Arm injuries prevented him from making majors; was in spring training with Chicago Cubs trying to make comeback. Should’ve taken: 11. George Springer, OF, UConn. The MVP of last year’s World Series has been the catalyst of Astros’ turnaround from cellar dwellers. Could’ve had: 8. Francisco Lindor, SS, Montverde Academy (Fla.); 14. Jose Fernandez, RHP, Braulio Alonso HS (Fla.); 18, Sonny Gray, RHP, Vanderbilt. The pick: 43. Taijuan Walker, RHP, Yucaipa HS (Calif.). Flashed potential, but M’s got steal when traded Walker, SS Ketel Marte to Arizona before last season for SS Jean Segura, RF Mitch Haniger. Should’ve taken: 70. Andrelton Simmons, SS, Western Oklahoma State. Magician with glove, has turned into best all-around SS in game for L.A. Angels. Could’ve had: 44. Nick Castellanos, 3B, Archbishop McCarthy HS (Fla.); 272. Jacob deGrom, RHP, Stetson. The pick: 2. Dustin Ackley, OF, North Carolina. Has played five positions this season for Triple-A Salt Lake Bees (Angels). Should’ve taken: 25. Mike Trout, OF, Millville HS (N.J.). An MVP favorite every season, would’ve won the A.L. award more than twice if Angels could stay in pennant race. Could’ve had: 17. A.J. Pollock, OF, Notre Dame; 59. Nolan Arenado, 3B, El Toro HS (Calif.); 221. Dallas Keuchel, LHP, Arkansas; 246, Paul Goldschmidt, 1B, Texas State. The pick: 20. Josh Fields, RHP, Georgia. M’s were hoping top collegiate closer could move quickly through system … he didn’t. Currently set-up man for L.A. Dodgers. Should’ve taken: 96, Craig Kimbrel, RHP, Wallace State CC (Ala.). This was the closer that moved quickly, becoming N.L. Rookie of Year in 2011 and six-time All-Star. 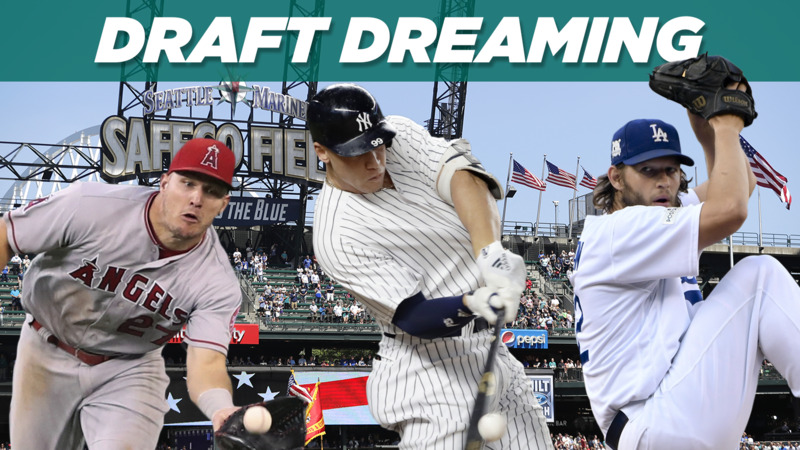 Could’ve had: 39, Lance Lynn, RHP, Mississippi; 72, Charlie Blackmon, OF, Georgia Tech; 127, Dee Gordon, 2B, Southeastern. The pick: 11. Philippe Aumont, RHP, Versant HS (Canada). Sent to Philadelphia as part of Cliff Lee trade. Spent last season in independent Canadian-American Association before getting shot this spring in Detroit organization. Should’ve taken: 76, Giancarlo Stanton, OF, Notre Dame HS (Calif.) N.L. MVP last year with 59 HRs, 132 RBIs; traded in offseason to Yankees. Could’ve had: 14. Jason Heyward, OF, Henry Co. HS (Ga.); 15. Devin Mesoraco, C, Punxsutawney HS (Pa.); 34. Todd Frazier, SS, Rutgers; 48. Josh Donaldson, C, Auburn. The pick: 5. Brandon Morrow, RHP, Cal. Has played 12 years for five teams and currently the Cubs’ closer, but next six picks combined to produce eight Cy Young Awards, five no-hitters and game’s most versatile reliever. Should’ve taken: 7. Clayton Kershaw, LHP, Highland Park HS (Texas). Coin flip with Max Scherzer, another multiple Cy Young Award winner, but we’ll take the lefty. Could’ve had: 6, Andrew Miller, LHP, North Carolina; 10, Tim Lincecum, RHP, Washington; 11, Max Scherzer, RHP, Missouri. The pick: 3. Jeff Clement, C, USC: Six of the first seven picks became All-Stars. Exception was Clement, who played just 152 MLB games. Should’ve taken: 11. Andrew McCutchen, CF, Fort Meade HS (Fla.) Five-time All-Star and former MVP could play LF now, with Stanton at DH. Could’ve had: 4. Ryan Zimmerman, 3B, Virginia; 5. Ryan Braun, 3B, Miami; 6. Ricky Romero, LHP, Fullerton; 7. Troy Tulowitzki, SS, Long Beach State; 12. Jay Bruce, OF, West Brook HS (Texas); 23. Jacoby Ellsbury, OF, Oregon State; 42. Clay Bucholz, RHP, Angelina. The pick: None (lost No. 22 pick for signing free-agent LHP Eddie Guardado from Minnesota). Could’ve had: 23. Phil Hughes, RHP, Foothill HS (Calif.); 38. Gio Gonzalez, LHP, Monsignor Edward Pace HS (Fla.); 40. Huston Street, RHP, Texas; 64. Hunter Pence, OF, Texas-Arlington; 65, Dustin Pedroia, SS, Arizona State; 75. Wade Davis, RHP, Lake Wales HS (Fla.). The pick: 37. Adam Jones, SS/P, Morse HS (Calif.). The M’s would’ve had the 19th overall pick, but lost it for signing free agent Greg Colbrunn. Instead, they took Jones, a five-time All-Star, with a first-round compensatory selection. Could’ve had: 114, Jonathan Papelbon, RHP, Mississippi State; 181, Matt Kemp, OF, Midwest City HS (Okla.). The pick: 28. John Mayberry Jr., 1B, Rockhurt HS (Mo.). Son of former Kansas City Royals standout became only first-round pick in franchise history not to sign. Should’ve taken: 57, Jon Lester, LHP, Bellarmine Prep. Four-time All-Star and three-time World Series champ was in the Mariners’ backyard, named state player of the year in 2000. Could’ve had: 44, Joey Votto, 1B, Richview Collegiate Institute (Canada); 80. Curtis Granderson, OF, Illinois-Chicago. Published: June 4, 2018, 10:43 a.m.